The Trump impersonator got a double dose of karma after his crime. Among the liberal Hollywood elites, there was once none more respected as Alec Baldwin. An award-winner, star of numerous hit films and TV shows, Baldwin has recently lost his reputation. And his mind. 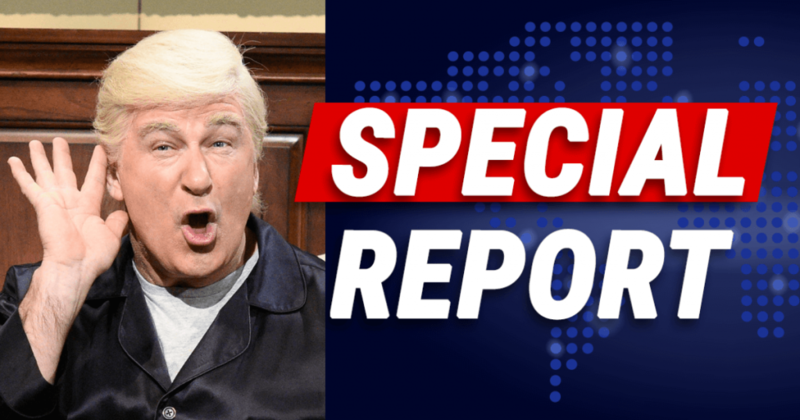 An outspoken Trump-basher, he has a blip of success portraying the President on Saturday Night Live. He even scored his own talk show on ABC. But it seems like his temper keeps getting the best of him. After numerous past run-ins that appears in the tabloids, Baldwin was arrested over an altercation. I guess when you scream your head off at a guy on the street, celebrity status means bunk in NYC. Now it looks like his career prospects are running out. ABC’s patience with The Alec Baldwin Show has ended. The news follows Baldwin’s arrest following a parking lot altercation in New York and dismal viewership for his ABC talker. SHARE if you think Alec Baldwin is a joke now! It seems like Baldwin’s show was a dude from the get-go. He never seemed to pack-in the viewers. But a highly-publicized confrontation, ending with an arrest is a bit too much for the Disney-owned ABC to stomach. Moving the show to a later time slot is like dumping someone on the graveyard shift. There is little hope Baldwin’s show will suddenly pick up new viewers that way. It is ABC’s way of quietly killing it, without making too much of a fuss. This turn of events is a real shame, for a once dynamic actor. Perhaps he let his political rage get the better of him—too many times. Some are suggesting Baldwin should run against Trump for President in 2020. SHARE if you think Trump would CRUSH Alec Baldwin in 2020!